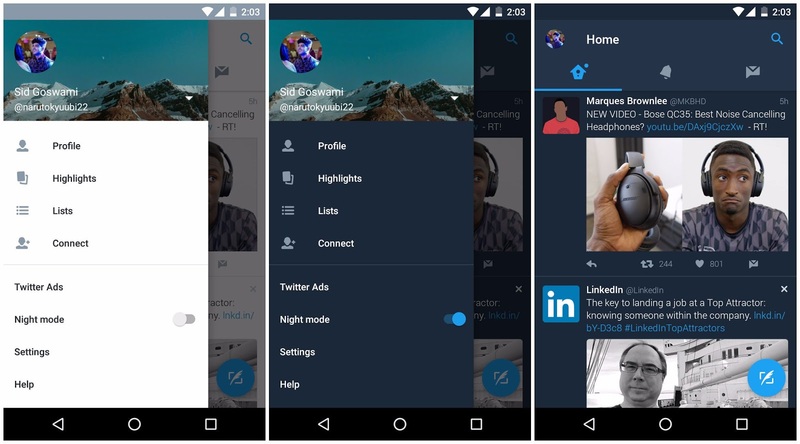 Last month it was reported that Twitter was testing out a night mode on its Android app, and the good news is that it looks like we could be getting closer to primetime because according to user reports, it has been discovered that Twitter has started to roll out the feature to some of its Android app users. This seems to be enabled server side meaning that you won’t need to update your app. But according to some users Twitter 6.4.0 Beta does the trick for them. Basically this seems to consist of a toggle that lets users turn it on and off. It is pretty straightforward and as you can see in the screenshots, it basically makes the app look darker. Like we said, the feature is rolling out to some users. There are other users who are using the beta who have not received the feature themselves, so like we said, it appears to be server side enabled. It is possible that Twitter is merely testing out the feature on a wider scale, so if you don’t see it yet, don’t worry. No word on when it is expected to make its way to all Twitter users (on Android and iOS), but for those of you who spend your nights in bed reading Twitter on your phone before you sleep, this feature could have your eyes thanking you. Remember this is server side feature but you can try your luck via installing the APK manually. Here is the version 6.4.0 Beta of the app and it can be downloaded from APK Mirror or you can download it from Play Store or to manually download the APK from APK Mirror .